The extent of ice accumulation on the grass near my place in Mount Pleasant. 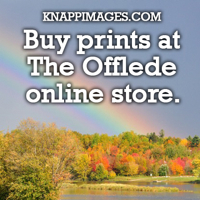 Surfaces with more surface area might have accumulated up to a quarter inch. 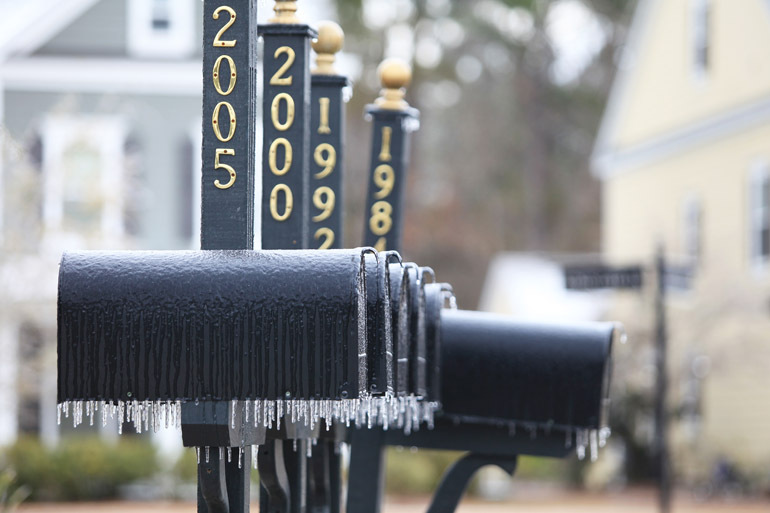 The Ice Storm of 1998 remains one of the fondest memories of my childhood. I was in the eighth grade in Down East, Maine. The storm started off as a lot of sleet: about 1 foot. And shoveling a foot of sleet is like shoveling sand. It's heavy and not fun. The ice was beautiful. So my family of photographers took pictures. It was cold. So we put the frozen food outside and the food from the refrigerator in an unheated entryway. The house was heated with a wood stove. So we were toasty. We cooked food on the stove or over an open flame in an outside fireplace. We once drove to the next town over and ate at one of the few restaurants in the area -- a real treat. The moon was just about full. So at night, my brother and I went sledding under its light. We made the most of what could have been a difficult situation. But when a storm with just a fraction of the severity of what I experienced in Maine happens in South Carolina, all hell breaks loose. Schools are canceled before anything starts falling from the sky. Bridges are shut down, and the lack of traffic and its friction allow them to glaze over with a coating of ice. People can't get to work because their children don't have school or because all the routes are blocked by what a native Mainer would call overly cautious authorities. That all happened late last month and again early this month. The first storm -- I don't know if you can even call it a storm, though -- started Jan. 28 in the Charleston area. The temperature was still above freezing when it started raining. But officials closed the schools early that day. They also would be closed for the next two days and would get a late start on the fourth day. 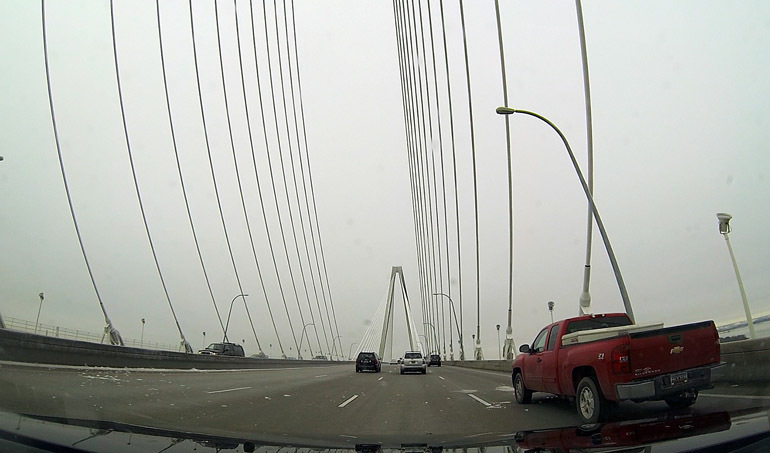 The Arthur Ravenel Jr. Bridge was shut down not long after the ground-level temperature hit 32 degrees. Smaller bridges followed, making it impossible for me to get to work in less than two hours. 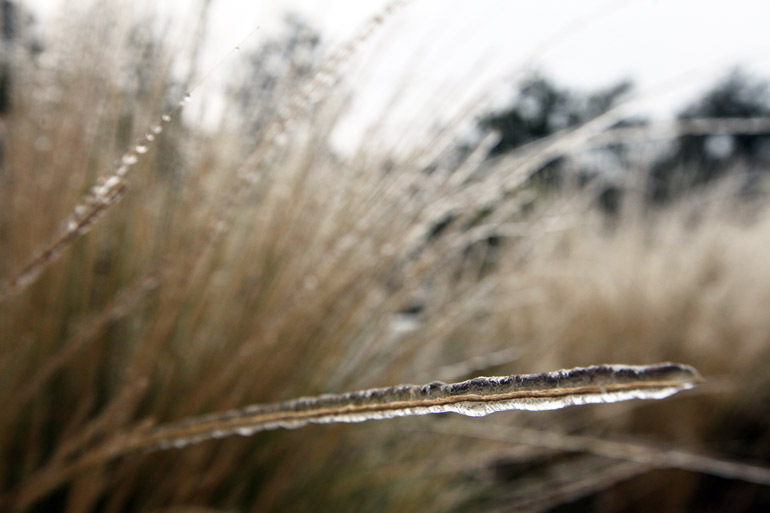 So I stayed home and took pictures of ice-coated vegetation before doing some actual work on news stories. The carnage was minimal in this storm. Some areas were hit with power outages, but they were not widespread. A pine branch fell over the sidewalk that I usually use for my daily runs, and that was the most extreme example of damage I witnessed. Ironically, the most damage that this storm did cause came when the temperatures rose. That Friday, as it climbed toward the 50s, the ice melted and fell from the cables of the Ravenel Bridge, smashing the windows and denting the metal of the cars traveling underneath it. Of course, authorities here knew this was a possibility, but it's not like they deal with these situations often. They closed it for seven hours, until the cables were clear of ice. So when the second ice storm hit the night of Feb. 4, they were even more cautious. 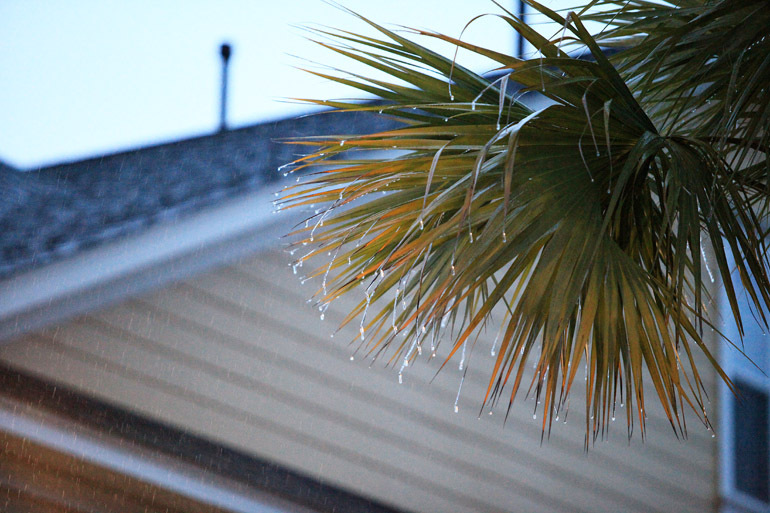 It didn't matter that the temperature in the immediate Charleston area had just barely hit 32 degrees during the rainy night. 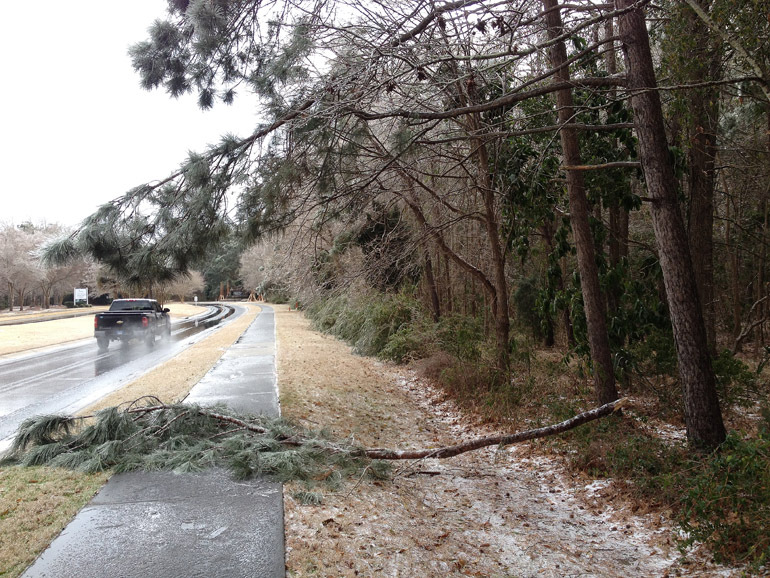 Ice formed on the cars and trees -- although not as severely as the first time (if you could even call that severe). I didn't even bother taking pictures. One of the two bridges from my home in Mount Pleasant to downtown Charleston remained open, so I got to work on time. But the main bridge was closed for more than two days as we all waited for the ice to melt off it. It didn't warm up so quickly after the second storm, like it did after the first. 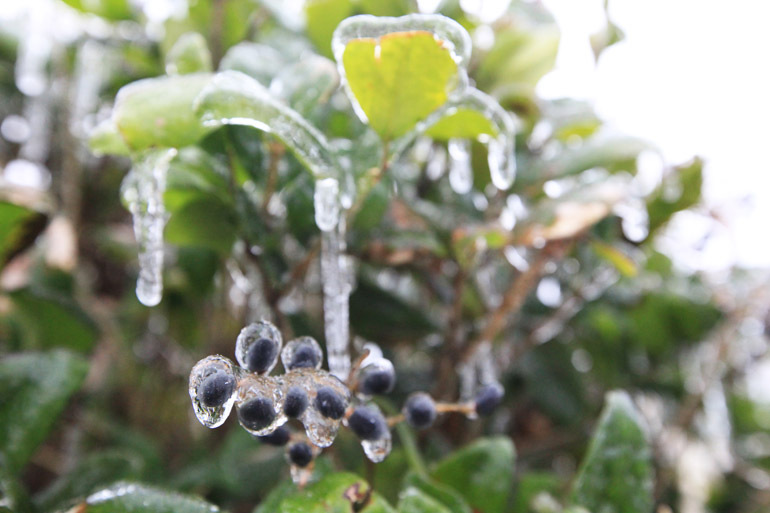 Schools were closed on the first day, even though the roads in Charleston County remained largely free of ice. They were closed on the second day, too, for a reason that still eludes me. The ice was gone here. A little farther north, in Dorchester and Berkeley counties (which are areas that my newspaper covers), the folks were not as fortunate. 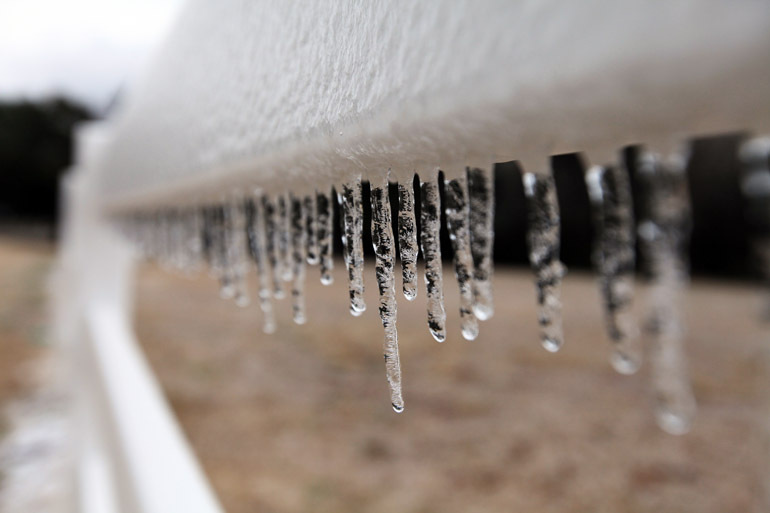 They, as well as residents of several surrounding counties, saw heavy ice accumulation. Power outages were widespread and were lingering in some spots as of this writing. My home is in a community where most of the lines are underground. We dodged power losses altogether. But my home also had no backup source of heat with which to cook food. There was no foot of sleet or snow on the ground for sledding. It wasn't cold enough outside to keep our frozen meat frozen. My wife and I would have been lost without our fully charged iPhones, and the same fate would have befallen my wife's daughter and her Kindle. So an ice storm like the one I saw during my childhood in Maine would not have been as much fun here in the Palmetto State. Residents here, homes here, officials here just can't deal with the problem as well because they're not supposed to have the problem. Our dog, though, loved eating icy grass. He enjoys eating grass and ice cubes, so eating both simultaneously was heaven. But even the dog -- the wimp that he is -- would have been shivering at night without electricity. So I'd prefer to keep all this sort of weather up north, where it belongs with the people and the dogs who are supposed to cope with it. 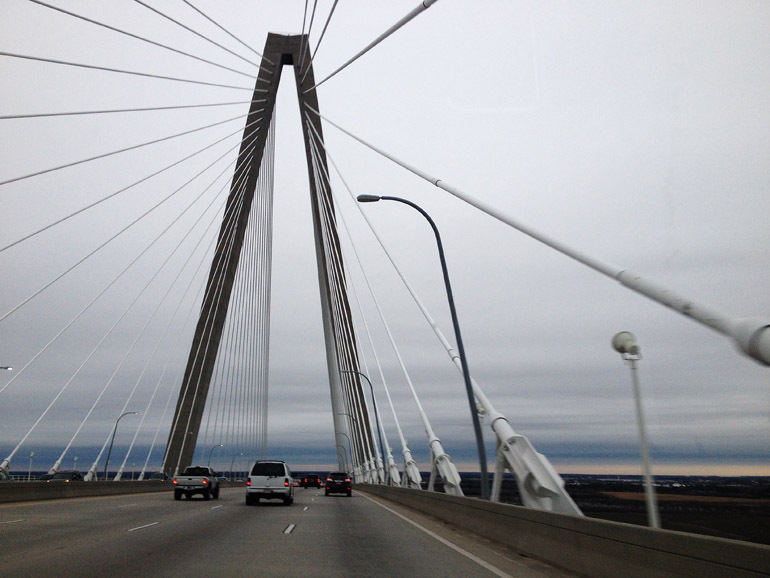 This was the Arthur Ravenel Jr. Bridge before the storm hit Jan. 28. 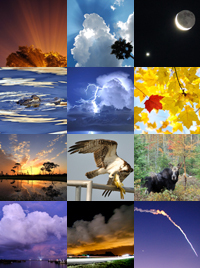 Layers of cloud cover are visible in the background. 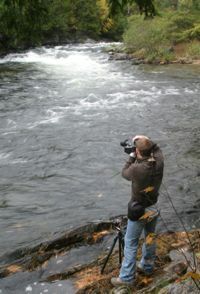 When it started raining late in the afternoon on Jan. 28, I wasn't deterred. I still went for a run. It was about 31 degrees. 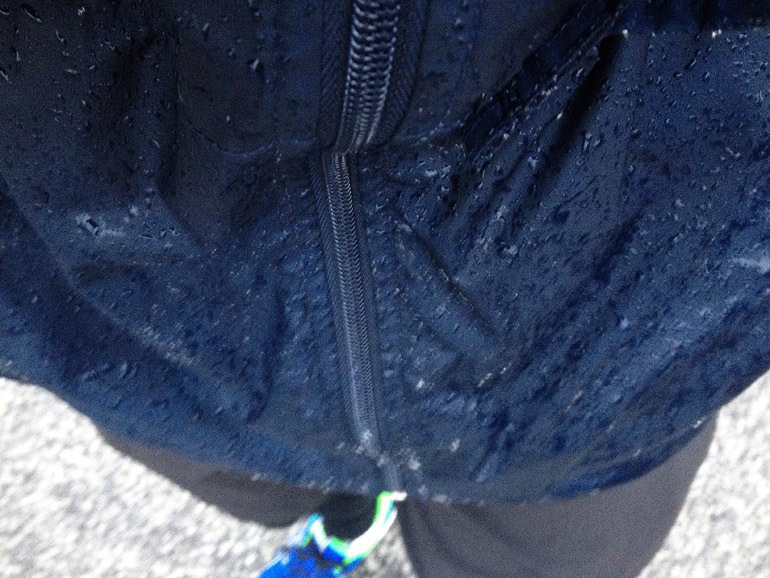 Even at that temperature, the rain still froze to my jacket. 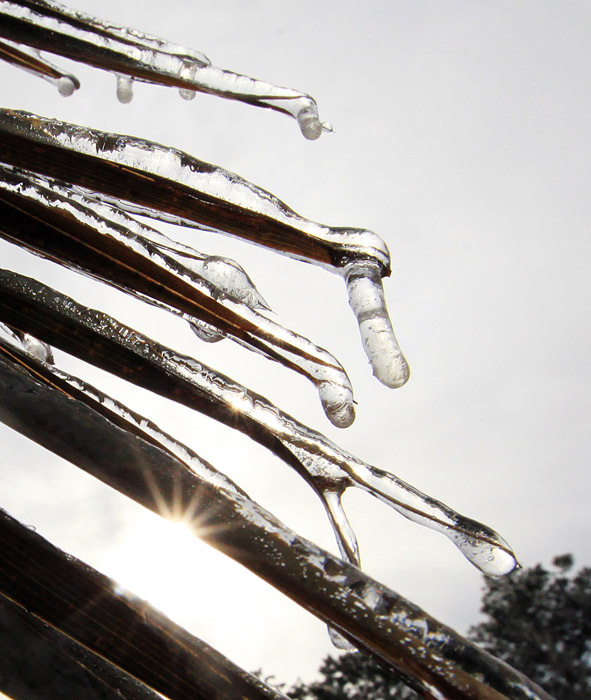 On Jan. 28, ice started to form on the tips of these palm fronds. 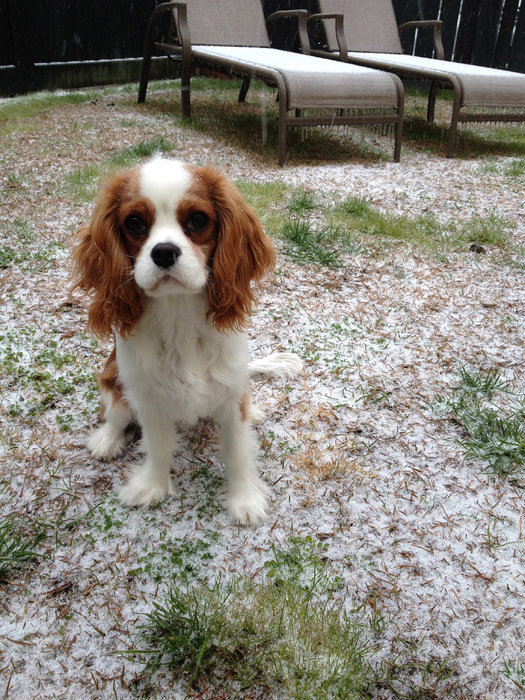 Winston got his first taste of a winter storm on the morning of Jan. 29. The storm included periods of sleet and was capped with a brief snowfall, hence the white stuff on the ground. This heavy accumulation, of course, caused traffic bedlam. 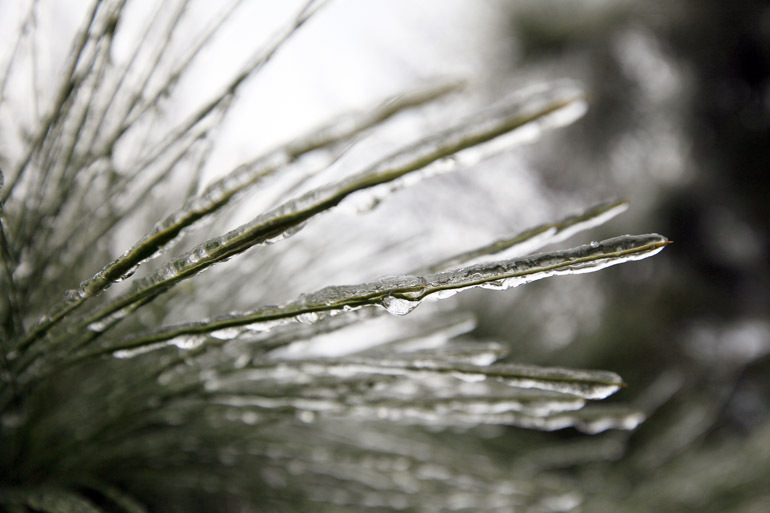 Pine needles and ice in my 'hood. These are mailboxes. That's right. Mailboxes. WITH ICE ON THEM! IN SOUTH CAROLINA! Is your mind blown yet? And this would be a fence. Pedestrian traffic was a nightmare after this branch fell. Luckily, there were no power lines near this one. You also can see that the featured truck is kicking up some good spray, indicating the elevated surface temperature of the road. It was wet but no slipperier than it would be on a rainy day. Bush and berries off a traffic circle near my family's pad. I tried to do something special with the sun and the ice on these palm fronds, but my macro lens (the one used for closeups) got stolen a few years back. Criminals are more destructive than this ice was.